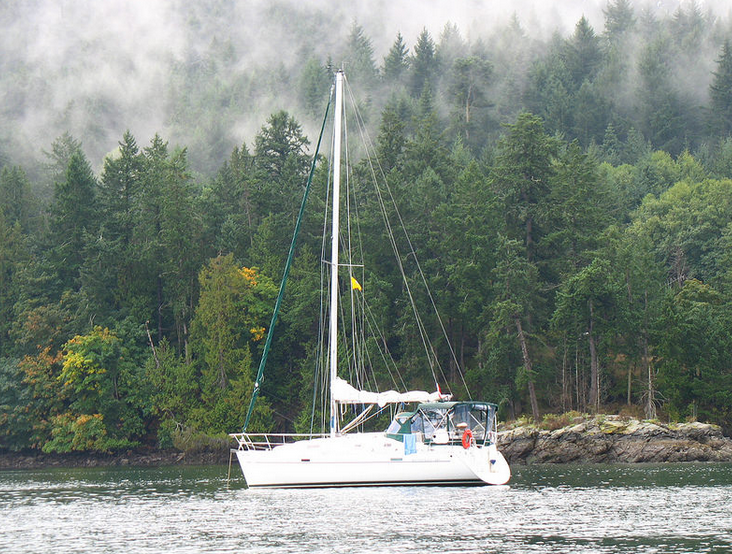 So the New Year is upon us, and if you are starting to dream about where to charter this year, then Desolation Sound is a fantastic choice of location for a Vancouver yacht charter. It is a very popular destination for sailing and boaters because of it’s spectacular fjords, mountains and wildlife all waiting for you to experience. Desolation Sound is located off the Northern End of Sunshine Coast, which is a region of the southern mainland coast of British Columbia on the eastern shore of the Strait of Georgia and just northwest of Greater Vancouver. In 1973 the British Columbian government created the “Desolation Sound Provincial Marine Park”, and the park itself now comprises of a total of approx 33 sq miles and over 37 miles of shoreline. It is a superb location to explore by yacht, if you are on a Vancouver yacht charter. You can take advantage of the many inlets, islets, coves and bays under the natural shelter of the park, and enjoy the spectacular vistas and the warm calm waters of the park are perfect for swimming and diving. You can also enjoy time ashore by taking refuge in the shady walking trails on the forested upland and around the small lakes. There are 3 major anchorages within the park, namely Prideaux Haven, Tenedo’s Bay and Grace Harbour. Prideaux Haven – is a perfect spot for exploring the sound, the anchorage consists of an elongated bay which is dotted with islands and small coves. There are not many facilities here, though you will find a pit toilet. Tenedos Bay – this beautiful sheltered bay is located east of Mink Island in the Homfrey Channel, again a lovely spot to enjoy the stunning scenery of the Sound and even enjoy a freshwater swim in nearby Unwin Lake. There is a campsite here with pit toilets available and an information shelter. Grace Harbour – is a large sheltered bay which is located in the beautiful Malaspina Inlet, there are some facilities here too such as pit toilets and an information shelter. Desolation Sound has colourful marine wildlife, schools of fish and larger marine mammals, keep your eyes open for sea lions and seals, if you’re lucky you might spot some porpoises too! In the summer, occasional pods of killer whales or humpback whales visit the waters in search of food. The warm waters are perfect for snorkelling, where you will likely see colourful sea stars, spiny red sea urchins and spiky sea cucumbers. This is a very popular destination for kayaking and canoeing, which are perfect for exploring the small caves that line the shoreline. It is possible to rent kayaks in some places, and there are a number of guided kayak tours available to book on to. Fishing is also a popular pastime, and regular catches will include salmon, rockfish, oysters, prawns, cod and snapper. Be aware though that appropriate licences are required in order to fish in British Columbia. Desolation Sound Provincial Marine park is extremely popular in the peak summer season from June – August, where you will find many other boaters, but this area can be spectacular to see in both the Spring and Autumn to see the changing seasons effect on the stunning surroundings.